It's not stalking if you have a licence: Did you hear the one about the lawyer...? 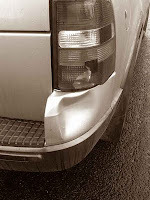 So, a lawyer drives into the back of my car. Deemed a 'no fault' accident as we were both reversing. Even though I saw him and stopped while he continued. Oh well, at least insurance covers it.